The clipboard on Windows and Mac only holds one item at a time, which can be limiting when you want to copy items from multiple files or multiple places in the same file. Wouldn’t it be handy to view your clipboard history and be able to access previous items you copied? Today we’ll cover some free apps for Windows and Mac that allow you to manage the clipboard history on your computer and some even allow you to sync the clipboard among different computers. 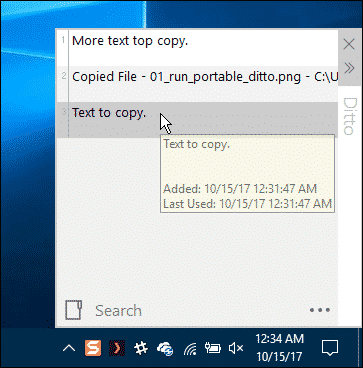 Ditto is a free, full-featured clipboard manager that allows you to search and paste previously copied entries. Entries can be pasted into any window that accepts standard copy/paste entries, including text, images, and even files. You can also sync your clipboard among multiple computers over the same network, merging the lists of entries. Ditto supports a very long copy history, so merging clipboards from multiple computers won’t be a problem. You can download Ditto as an installable or portable program. You can also install Ditto from the Windows 10 App Store. Click the Ditto icon in the system tray, or press “Ctrl+~” (the tilde key) to open Ditto. Click on an entry to copy it to the clipboard. Double-click or press “Enter” on an entry to paste that item to the previous window. You can also drag-and-drop entries to paste them into other programs. If you have a long list of entries, you can use the Search feature to find a specific entry. There are a lot of options available in Ditto to customize it. To quickly change some of the options, right-click on the Ditto icon in the system tray and turn on or off options on the “Quick Options” submenu. You can also access all the available options by selecting “Options” on the menu. To delete some or all the entries, select “Delete Clip Data“. 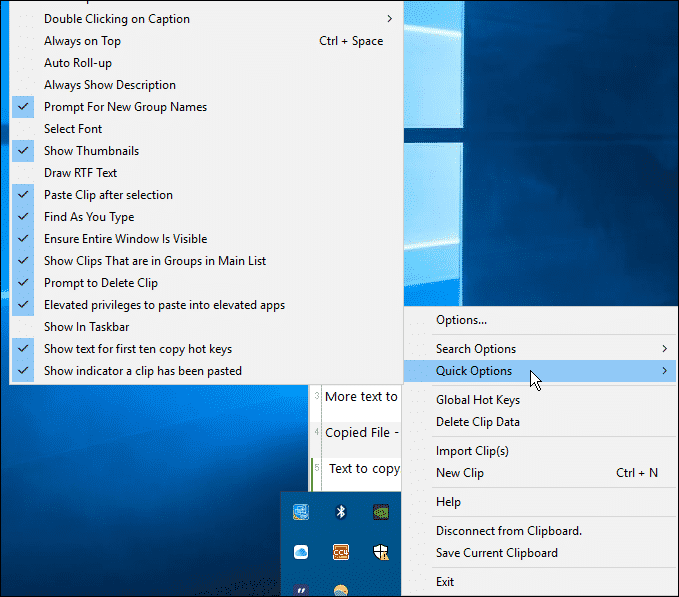 Select entries on the dialog box using the “Shift” and “Ctrl” keys and click “Delete“. If you have a long list, you can use the Search fields to find the entries you want to delete. Clipboard Manager is a nice looking, free program that stores text, images, and files. You can send any of the entries, or clips, back to the clipboard to paste into another program. You can even edit the images in Clipboard Manager. It comes with a very basic image editor. Clipboard Manager comes with three plugins to handle files, bitmaps, and text. You can send a clip to the plugins to make sure it’s handled correctly when you paste it. Download Clipboard Manager as an installable or a portable program. Right-click on a clip to access the menu, where you can send the item to the clipboard or to the plugins or delete the clip. 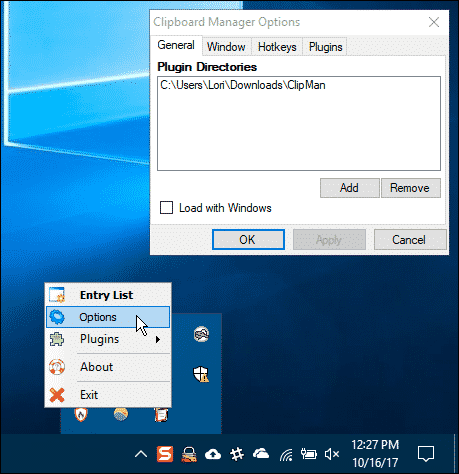 To access the options for Clipboard Manager, right-click on the Clipboard Manager icon in the system tray and select “Options” from the popup menu. 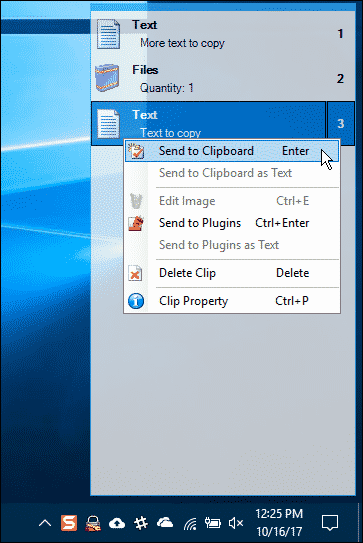 On the “Options” dialog box, you can add or remove locations for the plugins, choose to load Clipboard Manager with Windows, change the look and behavior of the window containing the list of clips, assign hotkeys, and enable and disable plugins. 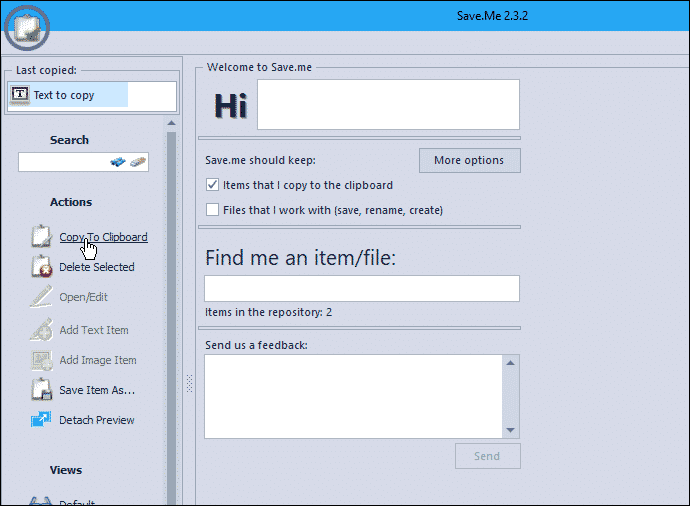 Save.me is a free, portable program that saves everything you copy, like files, folders, images, text, URLs, and emails, and organizes the items into different views. 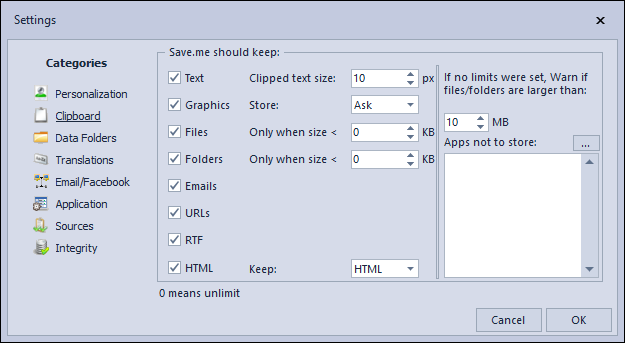 Download Save.me as a single executable file that you can run from anywhere. When you run Save.me, the main window opens. Here you can perform “Actions” on your items and view your list in different “Views” to access previously copied items. You can also search through your items, which is handy if you have a large list. You can even edit items before pasting them. 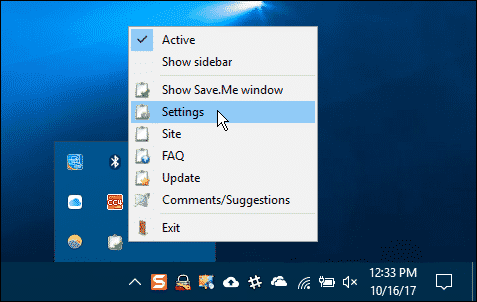 To access options for Save.me, right-click on the icon in the system tray and select “Settings” from the popup menu. There are several categories of “Settings“, including “Clipboard” settings that allow you to specify the types of items you want Save.me to keep. You can also prevent Save.me from storing items copied from certain apps. 1Clipboard is a free program for Windows and Mac that stores text, images, and even tables. It also allows you to seamlessly copy and paste content between Windows and Mac computers. 1Clipboard uses your Google Drive account to sync your clipboard between all your Mac and Windows computers that have 1Clipboard installed on them. You can star your favorite items for quick access later and search the list of stored clipboard items and copy them. 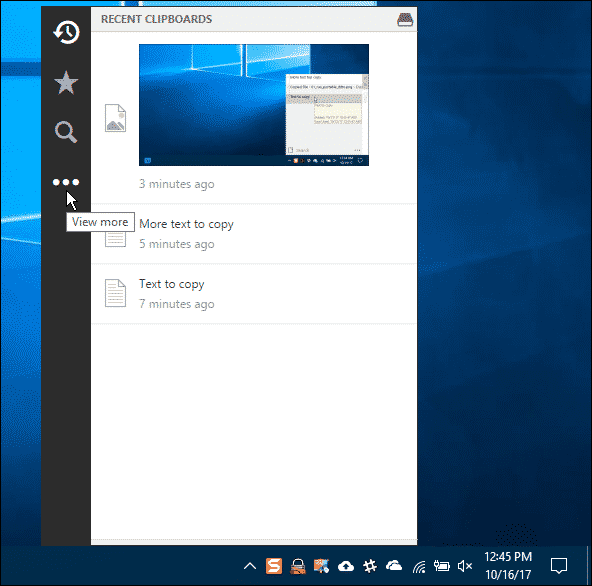 If you don’t want, or need, to sync your clipboard among computers, you can use 1Clipboard as a local clipboard manager. You can enable or disable the syncing feature at any time. To access 1Clipboard once you’ve run it, click the 1Clipboard icon in the system tray. To access settings for 1Clipboard, click the system tray icon and click the three horizontal dots on the black bar on the left. Then, click “Preferences“. 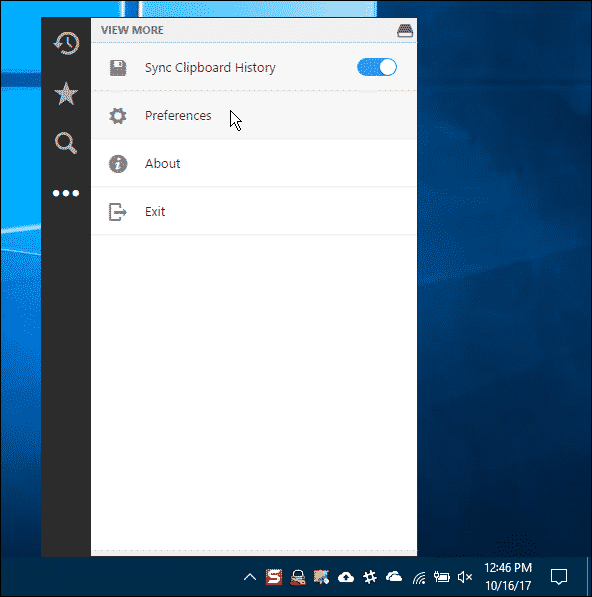 You can also enable or disable the “Sync Clipboard History” feature here. 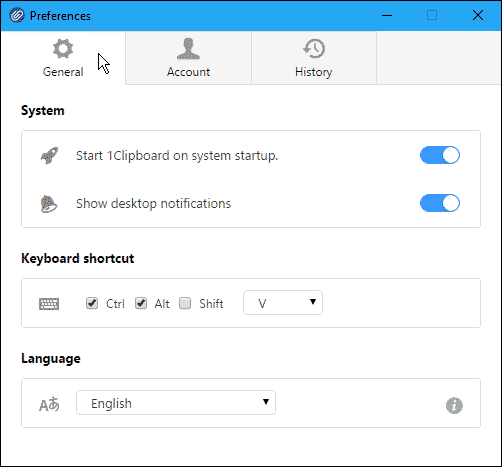 On the “General” tab on the “Preferences” dialog box, you can choose to start 1Clipboard on system startup and show desktop notifications. You can also change the keyboard shortcut used to copy the latest clip to the clipboard. The “Account” tab provides another place where you can choose to sync your clipboard among multiple computers. If you’re using 1Clipboard as a local clipboard manager, you can clear the locally stored clips on the “History” tab. What tool do you use to manage your clipboard history? Do you use a tool we didn’t mention? If so, which one? Share your thoughts and experiences with us in the comments below.